Islands are pieces of land that may be very far from continents. 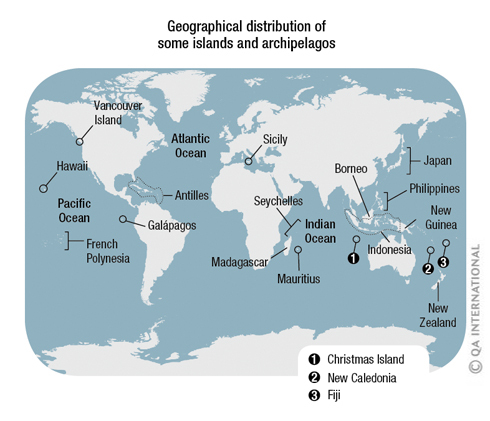 Geographical isolation has encouraged the development of rare and unique species on many islands. With few predators and competitors, island plants and animals have sometimes evolved into surprising forms that include flightless birds, dwarf elephants and giant tortoises. Islands are fragile jewels. Some may soon disappear under the water as ocean levels rise as a result of global warming. Island fauna is sensitive to the destruction of its habitat, which is already restricted. Voluntarily or otherwise, humans have introduced numerous plants and animals (rats, rabbits, dogs, cattle) to islands. Some species proliferate, take over and destroy the fragile balance of island ecosystems. The majority of animals to become extinct in the last couple of centuries were species endemic to islands. 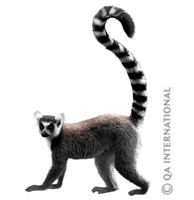 In the forests of Madagascar, ring-tailed lemurs (Lemur catta) form groups of 15 individuals on average, dominated by the most aggressive females. Unlike most other lemurs, ring-tailed lemurs are diurnal, meaning they are active during the day and sleep at night. One of their favorite activities is sunbathing, sitting with their legs and arms outspread. 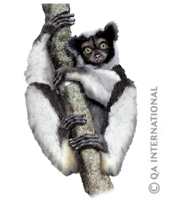 Measuring about 75 cm long, the indri (Indri indri) is one of the largest lemurs. The plaintive call of this diurnal herbivore, reminiscent of certain whale species, rings out through the Madagascar rainforest for several kilometers in all directions. Like numerous other species endemic to the island, the indri is now threatened with extinction by deforestation. Covered in stiff, prickly hairs, the common (or tailless) tenrec (Tenrec ecaudatus) is a nocturnal insectivore about 30 cm long that lives in numerous biomes in Madagascar. Holding an amazing record for fertility among mammals, it is the only one capable of giving birth to a litter of 30! The aye-aye (Daubentonia madagascariensis) is a nocturnal lemur the size of a cat, with the ears of a bat, the teeth of a rodent and the hands of a monkey! Its fingers are disproportionately long, especially the middle finger. It uses this finger to capture larvae in the cavities of trees, after it has gnawed away the bark with its teeth. 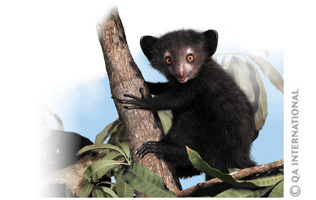 The aye-aye, which lives only in Madagascar, could disappear as a result of the loss of its habitat. Every spring, Christmas Island (in the Indian Ocean) is paralyzed by the invasion of red land crabs (Gecarcoidea natalis). These crustaceans leave their burrows in the forest on the island, crossing roads and passing through houses on their way to the sea. Arriving on the beach, the crabs mate and then deposit their eggs in the ocean. The larvae begin life in the water. In the early 1900s, humans exterminated the Maclear’s rat, which was the main predator of the red land crab, thus encouraging the proliferation of the species. It has now, however, become the victim of crazy yellow ants, introduced onto the island by humans! Aldabra giant tortoises (Geochelone gigantea) are endemic to the Aldabra coral atoll, in the southwest of the Seychelles archipelago, in the Indian Ocean. 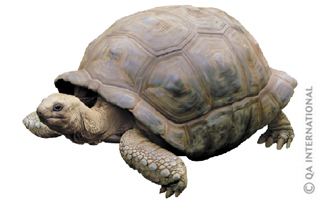 Weighing about 250 kg and standing about 1.2 m tall, it is the largest of the land tortoises, a record shared with the giant tortoise of the Galápagos. Thanks to numerous protection measures, the Aldabra tortoise is no longer threatened with exctinction and its population now exceeds 100,000 individuals. The kakapo (Strigops abroptilus) is an extremely rare nocturnal bird that lives only in New Zealand. It is the only parrot that cannot fly! The kakapo was very close to becoming extinct because of deforestation, intensive hunting and humans introducing predators such as cats and dogs. Luckily, a recent protection program managed to save it just in time. The forests of New Zealand are home to five species of kiwis (Apteryx australis), nocturnal birds that are unable to fly. The giant eggs of kiwis, some of which weigh almost 500 g, are six times larger than the eggs of chickens, which are birds of the same size! Kiwis are mainly threatened by the introduction of various mammals into New Zealand, including the ermine and the cat. Kiwis may be distantly related to the moas, giant flightless birds native to New Zealand that became extinct a few hundred years ago. The Philippine tarsier (Tarsius syrichta) is a minuscule primate measuring barely 15 cm in length and weighing less than 140 g! It is endemic to the rain forests in the southeast of the Philippines archipelago, where it feeds on insects, lizards and small birds. 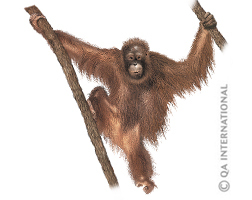 Closely related to humans, the orangutan (Pongo pygmaeus) spends its days in the trees of the rain forests on the islands of Borneo and Sumatra (Indonesia), searching for fruits, leaves, small invertebrates and birds’ eggs to feed itself. Like numerous other species endemic to the Indonesian archipelago, this great ape is gravely threatened by the destruction of its habitat, which is being replaced by palm oil plantations. Of all the suids (pig family), the babirusa (Babyrousa babyrussa) a has the smallest geographical distribution as well as the lowest population. There are estimated to be no more than 4,000 of these unusual wild pigs living in the marshy forests on a handful of Indonesian islands. 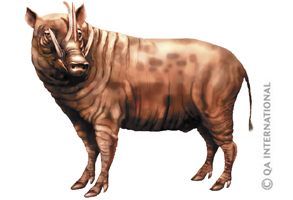 Along with being hunted for its meat, the babirusa is threatened by deforestation and mine prospecting, which are destroying its habitat. The marine iguana (Amblyrhynchus cristatus) lives in groups on the rocky coasts of the Galápagos Islands. This large 1 m long reptile that eats seaweed is the one true living marine lizard. Its powerful tail allows it to easily swim underwater to find food. The woodpecker finch (Camarhynchus pallidus) feeds itself in an ingenious way. 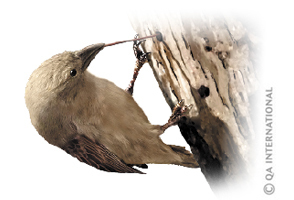 This songbird endemic to the Galápagos holds a twig or cactus needle firmly in its beak. Probing the cracks in the bark of trees, it searches for insect larvae, which it skewers on its pointy tool! 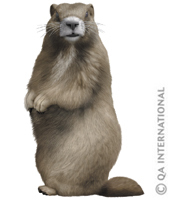 There are only about 100 Vancouver Island marmots (Marmota vancouverensis) still living in the wild. The presence of various predators as well as the gradual destruction of their habitat and the plants they eat are seriously threatening them with extinction. These marmots live in the mountains on Canada’s Vancouver Island, to which they are endemic. The Japanese macaque (Macaca fuscata) is endemic to Japan, as are 25 percent of the species of vertebrates of the archipelago. Gathered in groups of some 20 to 30 individuals in the mountain forests, these macaques are the monkeys that live the farthest north on the planet. 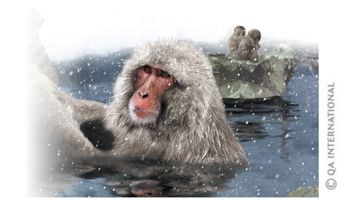 They can withstand temperatures of –15°C, sometimes taking shelter in the warm waters of hot springs. The Bahama amazon of Great Abacco Island (Amazona leucocephala bahamensis) in the Caribbean nests underground. Here, the water has hollowed out large cavities in the limestone base of the island, making perfect burrows for parrots to lay their eggs and raise their young. These cavities protect the birds from the frequent forest fires. 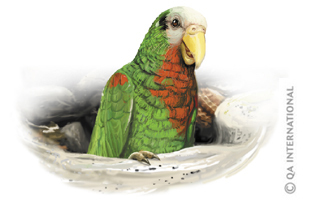 Long threatened by the trafficking of parrots for pets, the Bahama amazon is now protected and has been successfully reintroduced into its native environment. Terrestrial biomes, ecosystems of the planet !